Since we've had some issues with members giving generic responses to your introduction posts. We're going to need your help to liven things up. So. To give you guys a more productive introduction thread and to get ADK members to acknowledge you more and respond in a more engaging manner. I'd like to ask you to give us more then. "hi my name is xxxx and I play this game"
Tell us about you. Maybe some of your game interests. Let us know how you found us. Maybe some hobbies. An age and a first name? Maybe some interesting tidbits about you. This is an interview process. We want to get to know you and about you before we welcome you into our community. So make your introduction something worth responding to. Do some of these things. I promise you we'll respond and engage in dialog with you. Added benefits is simple. Your post count goes up as you respond to us. Which gets closer to your post requirements. You make new friends and you're more welcomed within the community. Make sure to be in teamspeak as much as possible. Make an awesome introduction thread. 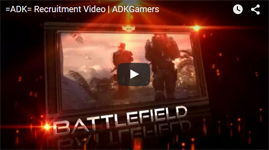 Get your 20 posts and on Wednesday I'll welcome you into ADK as one of our newest recruits. Welcome to ADK. Can't wait to slap some ADK tags on you. Exactly THAT. That is the reason why I stopped posting on member apps lately, because every single of them is almost the same, the more creative ones write the same like in the intro post, but that is it. How am I supposed not to give generic answer when I get generic text? For example, you go to restaurant. Every time you go there, the waiter asks you the same question: "What would you like to eat". If you don't ask him what do they have / what he recommends, you are going to give him the order and he walks away. Can I please get this post locked and pinned so it is readily visible for our newer people. Once that is done. Can you hide this post please. I support this btw. Used to preach this as well.